The expressive images of June FARNHAM show nature at its most luminous. Her inventive works use dramatic color palettes and abstracted forms to convey the ever changing natural landscape. Her contemporary landscape paintings reflect the moods, colors and forms of nature particularly at Teatown Lake Reservation and along the Hudson River. Currently FARNHAM uses her own photographs to capture landscape images often near sunset during park walks. Using these photographs as a basis to trigger her art work, FARNHAM modifies the color schemes and shapes into compositions that are part reality and partly reflect her own artistic view. Although largely realistic in composition, she experiments with abstraction as a way to express what nature offers to the eye. While attending college, she studied art and architecture and focused on architecture for her career. 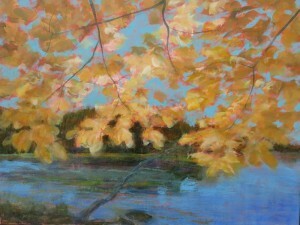 FARNHAM has in the last decade renewed her interest in painting and studied techniques and composition on her own and in classes. Her paintings are in private collections and the collection of the Ossining Public Library.